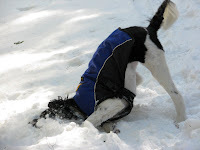 Today, it is predicted that Vermont is getting heaps of snows! Many activities can ONLY be done with fresh snow, but one in particular is certain to tickle your taste buds. Use fresh, clean snowflakes to make your own ice cream. This recipe is a great way to get outside and have fun with family and friends while creating a treat! Best if made outside, so the bowls stay cold while mixing. Gently fold the condensed and evaporated milk into the snow. Add the sugar and vanilla. Mix well. Stir until it looks like ice cream and then serve in a bowl or cone. For those of you that are chocolate lovers, adjust the ingredients a little. 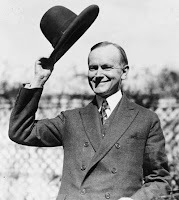 Did you know that Calvin Coolidge was sworn in as the 30th President of the United States by his father, in his boyhood home of Plymouth Notch, Vermont on August 3, 1923? Why not spend today, President's Day, in a state park named after one, Coolidge State Park? While you're there, enjoy great winter hiking, snowshoeing, or skiing. Click here for a winter trail map. After taking in beautiful views and fresh air, travel a short ways down the road to Calvin Coolidge Historic Site where you can fill up on stories about President Coolidge and other historic facts. beggared themselves to serve others. The weather's changing with warmer days, but still cold nights. We're not sure if it's going to snow, rain, or do nothing at all this weekend. So, we've put together a list of fun winter activities for all types of February weather. Directions: Poke a small hole in the bottom of the container (just enough for a drip to go through) and find a place outside to hang it (not over a walkway since it will be creating ice!) Mix some water with a flavoring, such as some maple syrup or juice and fill the container. It's best to put the container outside at the end of the day and the next morning you should have a homemade icicle! *Note the size of the icicle depends on the temperature and the size of the hole - try a few different locations, hole sizes, and times of day. Enjoy experimenting and a frozen treat! Moose's Great Granola - Recipe Revealed! 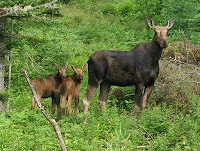 One of the most asked about foods made by Seyon Lodge Innkeeper, JessieMae, is a recipe called "Moose's Great Granola". You might wonder where “Moose” factors into this. Don't worry, no moose meat is in this granola. Moose was a nickname JessieMae gave her mother as a teenager and it stuck! Friends and family still lovingly call JessieMae’s mother "Moose" today. This is a great recipe to do with family and friends and a perfect snack during long hikes or when you're out camping this summer.